Got to try this Japanese restaurant in Regis Center Katipunan called Moshi Moshi together with other Openricers last month. "Moshi Moshi" is a widely used Japanese language greeting to mean hello when answering the telephone or to get somebody's attention. In this case, the moment we entered the cool and brightly lit Moshi Moshi Restaurant, it certainly caught our attention. The program started with a brief introduction of Moshi Moshi and a question and answer game afterwards. Winners received a unique moshi moshi mug that changes its appearance when hot water was placed into it. I love the sweet caramel and roasted milk tea flavor. The drink was not too heavy and I'd certainly order this again on my next visit. The miso soup was incredibly affordable given its taste. For just P35, you'll get an authentic taste of miso soup just like those in other Japanese restaurants. Moshi Moshi's pan fried gyoza fell short of my expectations. It wasn't that meaty and I find it a bit mushy too. Their takoyaki on the other hand was a winner. Again for its price, it is definitely worth a try. The takoyaki balls were soft and I love the bonito flakes (Katsuobushi) on top. The sauce drizzled all over added to a much flavorful taste to the takoyaki. Their california maki rolls were thickly sliced with generous amount of fillings. Nothing extraordinary but is already affordable given its price. A new item which will be added to their menu soon is their salads. 2 kinds of salad would soon be available in Moshi Moshi which is definitively something people who really love salad should look forward too. A huge serving of mixed salad that consist of shreadded carrots, kani and cucumber with corn kernels, seaweed, mango bits and mased potato on a bed of fresh and crisp lettuce. It came with 4 kinds of dressing (L-R)-Chinese dressing, French dressing, Roast sesame and Japanese dressing. For me, the best dressing is the roasted sesame dressing. Reminds me of the same dressing we had in Yabu for their unlimited cabbage. The kani salad looks really good with the tempura pieces on the side and the drizzles of Japanese mayo over it. Now for the best part, Moshi Moshi's Bento Boxes. Moshi Moshi offers different kinds of bento set meals. I just love bento boxes. It enables us to try a little bit of everything. Right? It's like a complete set meal for the price of one. 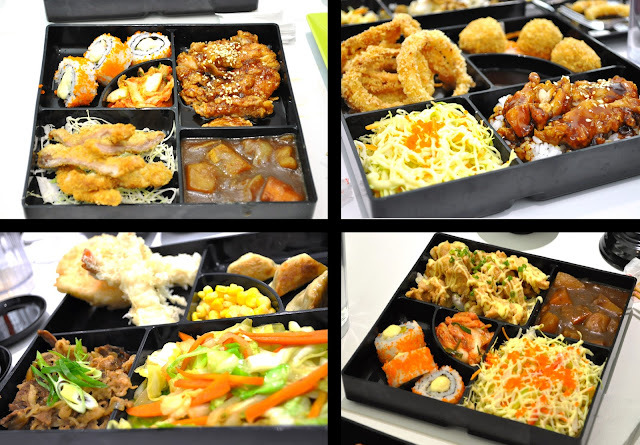 And soon, they will also offer a Create Your Own Bento for just P155. Now, you may easily choose your rice toppings with side dishes of chicken karaage balls, onion rings and kani salad. I personally like their gyudon set. The beef was soft and tender with just the right amount of sweetness. The onion rings were really crispy and the breaded karaage balls had this cheese surprise inside. Finally, a cup of their soft serve strawberry ice cream to end the meal. It took a long time for them to serve the ice cream but we maximized the waiting time to mingle and get to know other openricers. I'd definitely visit Moshi Moshi again. With their reasonable menu prices, no doubt many students and residents within the area go to Moshi Moshi for their Japanese cravings. 2F Regis Center, 327 Katipunan Ave.
Food looks good and it's affordable. Will definitely give this a try when I'm in the Katipunan area. Me like those Bentos... Especially the "Kin" one.